Messes and super wicked problems | Climate Etc. Believe it or not, “messes” is a technical term used to describe complex problems. Social messes are resistant to analysis and to resolution. Kelly Levin, Benjamin Cashore, Steven Bernstein and Graeme Auld introduced in 2007 the distinction between “wicked” and “super wicked problems”. They first presented International Studies Association Convention in Chicago, February 28 – March 3, 2007. They presented a revised version of the paper to the Climate Change: Global Risks, Challenges and Decisions Congress, 10–12 March 2009, Copenhagen, Denmark. While the items that define a wicked problem relate to the problem itself, the items that define a super wicked problem relate to the agent trying to solve it. Global warming is considered as super wicked problem by others. Wicked Problems (equivalently, Social Messes) are seemingly intractable problems. They are composed of inter-related dilemmas, issues, and other problems at multiple levels society, economy, and governance. These interconnections—systems of systems—make Wicked Problems so resilient to analysis and to resolution. Wicked Problems include issues such healthcare in the United States and elsewhere, the AIDS epidemic and perhaps other emerging diseases, global climate change, pandemic influenza, international drug trafficking, terrorism, homeland security, and nuclear energy and waste. Since 1999, one of us (Horn) has been developing an approach to resolving Wicked Problems that combines interactive group processes with Visual Analytics to produce (among other outputs) detailed graphical representations and analyses of Wicked Problems. Another of us (Weber) has been a leader in applying a particular form of scenario planning that we call Resolution Scenario Mapping. Resolution Mapping is a knowledge-based, highly interactive group process for analyzing contingent Events and divergent outcomes. Participants can choose their most desirable and attainable outcomes and those milestones or Events that lead logically to the desired outcome. Implementing key Events substantially increases the likelihood of resolving the Wicked Problem at hand, at least for a period of time. In this paper, we show how Mess Map diagrams and Mess Mapping and Resolution Mapping processes can be used to represent, analyze, evaluate Wicked Problems and then to choose actions that ameliorate the Wicked Problem at hand. Resolution Mapping and Mess Mapping are each powerful process and analytic tools for helping stakeholders resolve Wicked Problems. These tools can be successful where others have failed (or have feared to tread) because both incorporate or address uncertainty and risk; complexity; systems interacting with other systems; competing points of view and values; different people knowing different parts of the problem (and possible solutions); and intra- and inter- organizational politics. “C-level” executives, Boards of Directors, thought leaders, authorities, and change agents will find Mess Mapping and Resolution Mapping indispensable for creating consensus, choosing specific actions, and determining responsibilities for implementation. JC comment: I find this pretty interesting. Climate change to me seems to be the mother of all messy super wicked problems. I like the mess mapping approach, with scenarios, etc. This makes much more sense to me than developing a scientific consensus that all but demands a specific policy. This entry was posted in Policy, Uncertainty. Bookmark the permalink. Yes, Kim, eating is still an individual choice for those in America who are not institutionalized. “The United States has less than 5 percent of the world’s population. But it has almost a quarter of the world’s prisoners.” [Adam Liptak, NY Times, 23 Apr 2008]. Dwindling Bill of Rights, Excess surveillance, Over-population of prisons, Politically-correct tyranny, Consensus “science,” Post-modern “science,” Continuous “war on terrorism”, Financial insecurity, Declining response to official misdeeds (Watergate, IPCC-gate, Climate-gate, Gleick-gate), etc. Fear of mutual nuclear annihilation following the vaporization of Hiroshima on 6 Aug 1945 and the Cuban missile crisis in late Oct 1962 scared world leaders into adopting unrealistic policies that now threaten the security of our society, including even the security of world leaders and their allies. I will update the summary on deep historical roots of the global climate scandal to more completely show the link of our “super wicked problems” to world leaders first glimpse of the destructive force of nuclear energy. That will be the theme for the update. This social insanity was guided by lock-step, consensus opinions that scientists championed in exchange for research funds from politicians who were scared by the prospect of mutual nuclear annihilation after Hiroshima vanished on 6 Aug 1945. AGU (American Geophysical Union) and the Geophysics Section of NAS (US National Academy of Sciences) were already leading the campaign of misinformation eleven years after Hiroshima in 1956, when normal channels of communication were blocked for evidence of natural “Nuclear Fires” on Earth [1-3]. Thirty-one years later, in 1976, the same group thwarted efforts to report evidence that our elements were made in the Sun [4,5]. Fifty-one years later, in 1995-1998, NAS apparently encouraged NASA scientists to hide isotope data from Jupiter that confirmed local synthesis of elements in the Sun . Fifty-six years later in 2001, papers presented at the SOHO-ACE Work­shop on Solar and Galactic Composition in Bern, SWITZERLAND (6-9 Mar 2001) and at the Conference on Asteroids: From Piazzi to the Third Millennium in Santa Flavia (where Galileo taught near Palermo), ITALY (11-15 June 2001) were blocked from publication. Now sixty-seven years later, continuing efforts by AGU and NAS to distort information was confirmed by the actions of Dr. Peter Gleick in obtaining Heartland Institute internal documents under false premises. Economic and social disintegration naturally followed the adoption of government policies based on misinformation about environment and energy. 1. P. K. Kuroda, “On the nuclear physical stability of the uranium minerals,” Journal of Chemical Physics 25, 781 (1956). 2. P. K. Kuroda, “On the infinite multiplication constant and the age of the uranium minerals,” Journal of Chemical Physics 25, 1256 (1956). 3. P. K. Kuroda, “Origin of the Chemical Elements and the Oklo Phenomenon” (1982). 4. O. K. Manuel and D. D. Sabu, “Elemental and isotopic inhomogeneities in noble gases: The case for local synthesis of the chemical elements,” Transactions Missouri Academy Sciences 9, 104‐122 (1975). 5. O. K. Manuel, D. D. Sabu, Roy S. Lewis, B. Srinivasan, and Edward Anders, “Strange Xenon, Extinct Superheavy Elements, and the Solar Neutrino Puzzle,” Science 195, 208-210 (1977). Now even, more wicked problems for the yet uneducated. You want to kill the cancer, but your toxic drugs also kill normal cells. You titrated with a drug, but that kills hair follicles, the gut lining, bone marrow and toe/finger nails. You help the nails by putting wine coolers on the feet and hands during treatment. You can aid the gut using steroids, but steroids cause more immuno-suppression. Tumor shrinks, by patient becomes malnourished and open to infection. Switch drugs and get higher white cell counts, but liver/kidney damage, so use hydration therapy. This cause brain swelling, and opens the brain up to infection. Patient continues to lose weight, so stop chemo so body weight can increase, but you now have a drug resistant tumor. Switch to gamma-knife, and get more immune-suppression, more nausea and falling body weight. Prophylactic antibiotics now causing nausea and diarrhea. Patient now thinks 6 weeks of opioids and food is better than 20 weeks of chemo and shakes. Doc, thirty years ago I thought chemotherapy would go the way of frontal lobotomies and be replaced by designer immunotherapy targeted at each individual cancer. What happened? Firstly you need humanized antibodies to bind to surface cell epitopes. Cancer cells, on the whole, do not have unique epitopes. Instead, a tumor is a heterogeneous mixture of different cell that have unique patterns of surface epitopes. So you need to do individual epitope mapping of a tumor biopsy, then use a range of humanized antibodies (which do not exist at the moment and cost $250,000 to establish a cell line making a monoclonal humanized IgG). 1 drug per IgG is no good, typically you have <40,000 epitopes per cells. so then you need to have a drug vector, the drug needs to be held to the antibody in general circulation, but released on the cell surface. The half-life of an IgG in the body is about 12 hours, site directed mutagensis of the hinge region could double that, but that is about it. Any idiot can kill 30% of a tumor, killing 70% is very hard and killing all is very difficult indeed. They are real bastards, up-regulating or duplicating different sections of DNA as a matter of course gives rise to sub-sets of cells, within the same tumor, with different drug sensitivities. They also package DNA, normally from fragments of chromosomes they have found useful, into blebbs. These packages of DNA, DNA minutes, are then passed between cells. Thus, if one hits on a section of DNA that provides drug resistance, it can be shared with sister cells. As there is always more than one way to achieve resistance, by playing DNA swapsie, they become very drug resistant, very quickly. The trick is to kill them before they have a chance to develop drug resistance, which means combination therapy, delivered to the cell surface at very high dosages, designed to kill them all, within a 12 hour window. So at minimum, you need three drugs, carried by three different IgG; with the drugs acting in a manner to potentate each others action (i.e. different targets) that bind to cancer cells, deliver their load, and kill them within about 12 hours. However, you have to make sure that your choice of epitopes does not match any other normal cell type. No good killing the tumor and also destroying another type of cell. Designing such a system is very hard, but being done. And on top of everything, each individual patient probably reacts differently and for different reasons — reasons that may or may not be understood. It’s a problem that requires constant feedback — something which climate engineering will not have, if we’re ever so stupid to try it. Can you help here, please ? ianl8888, listen your own damned oncologist! They know what they are doing, they have the biopsy and know what type of tumor they are treating. It is quite alright to read and learn all about what cancer is and what treatments are being used; but, an oncologist is going to know way more than you ever can. For once, go with an appeal to authority, don’t do a Steve jobs and try an alternative medicinal approach. Even Stage III(A-D) has a >50% survival rate now. Support your wife, make sure she eats, pray to you God if you have one, and follow the medical advice. An epitope is the three dimensional surface shape/charge structure that an particular antibody binds to.Epitopes can be proteins, lipids, carbohydrates, chemicals, minerals or pretty much anything with a specific shape. Doc, I think you’ve misunderstood his intentions. Targetted, and very drastic. Fevers and shakes almost unto death, then complete remission! My bad didn’t see it was already posted. Doc, I tend to be a fan of focused radiation therapy. A funny post. Thinking a bit about it i believe most of the messes and wicked problems are those you make up yourself. Wthout connection to reality the solution can not be a part of reality either. When you try to solve these problems with real measures, then you end up where you started. The only thing we need to address the climate change problem are models with sufficient accuracy to predict the rate of sea level rise as a function of CO2 levels. This is an enormously daunting technical problem because it depends so much on modeling the behavior of the ice sheets. But until we have this technical capability there is no hope of prevailing against the hundreds of millions of dollars that Big Oil is spending and will continue to spend to insure the continued use of petroleum as a fuel. This will never happen. Not now, not in a few decades, not in one thousand years. That is the very nature of a “messy” or “wicked” problem. With the recent paper that Dr. Curry and others published, that sufficient accuracy is closer than ever. When you get the Ice Albedo right, you are on the right path. It is to indict Big Oil,but I have never seen any proof of your mantra accuasation because there is none. What is well known is that the IPCC and various goverments have spent hundreds of billions fundiing “research” that has yet to prove the AGW theory. Big oil companies recognize dry holes, while climate alarmist research replicates one dry hole after another. Just keep on drilling Ross while the sane amongn us FDALMAO. You might start laying out how the hundreds of billions are distributed used by telling, how much the IPCC has provided funding. A dry hole, with liars at the top. Focus, Pekka, focus. The most wicked problem that we will ever face is how to come up with a cheap replacement for crude oil that has the same energy density required to keep an airliner aloft. The fact that oil companies recognize dry holes, yet have never ever sponsored a mass-marketed reference book illustrating the eventual end of the oil age is absolutely astounding. Every other industry known to man has marketed their future-think, such as Bell Labs, IBM, etc, but understandably, there is nothing in it for an oil company to predict its own eventual demise. It is up to others to fly that flag — however momentarily depressing and challenging the subject matter is. Some of us are up to it, but the whole AGW controversy keeps getting in the way. That seems awfully convenient to the people that maintain BAU, don’t you think? If AGW wasn’t a problem, what would we be doing differently to adopt alternative fuel sources? And where would all the climate skeptics then go? I hazard a guess that the majority would take on the mantle of oil cornucopians, promising limitless crude oil for the foreseeable future. They are not about solving problems, but about squeezing every last ounce of juice out of the system while they can, and letting future generations sort out the hard problems. The idea that addressing climate change, however it might or might not be caused, will cost more in the future than it does today is about the least credible idea in the entire debate. Imagine if we had addressed climate change in 1990 with solar power. The cost of solar power has halved since then. How many benefits would we have forgone to make that investment? At this point there isn’t a single confirmable gain, financial or otherwise. Perhaps the most intractable problem in the energy debate is that renewable advocates refuse to accept anything but an Immediate Total Green Solution. They’ve been “fighting” for the ITGS for 20 years and have nothing to show for it but sorry excuses about the Big Oil Conspiracy. What they need to do is face facts: there is no Big Oil Conspiracy. People reject their ideas because their ideas are intellectually weak and economically devastating. Web HubTelescope: The most wicked problem that we will ever face is how to come up with a cheap replacement for crude oil that has the same energy density required to keep an airliner aloft. Since biofuels can do that, the question is whether we can breed varieties that grow with saline irrigation on otherwise unused coastal deserts, at low enough cost. I don’t know whether it is possible, but it looks like a straightforward crop breeding problem rather than a “wicked” problem. Since biofuels are supposedly a carbon-neutral solution, you have just solved the AGW as well. We will have to see the energy balance on biofuels and whether they use more fossil fuels than they produce. They routinely need lots of fertilizer to achieve high yields. Perhaps the problem is more challenging than on first thought. Any wicked problem can be solved by magical thinking ;). I did a back of an envelope calculation on the area of algae cultivation needed to replace all the liquid fuels used by the USA, using the best Diesel production figures. The USA could just about do it using the Gulf of Mexico, although a hurricane like Ike would bring the USA to a standstill. Doc Martyn: I did a back of an envelope calculation on the area of algae cultivation needed to replace all the liquid fuels used by the USA, using the best Diesel production figures. Using best production figures from before the advent of modern crop and animal breeding you couldn’t feed the current US population on American arable land. This does not prove that biodiesel from algae will necessarily work, but it does show that current “best” is not necessarily relevant. Besides, it’s foolish to consider replacing the entire liquid fuel supply at once from one source. The current liquid fuel supply system wasn’t built that way, and it won’t be replaced that way. You could supply military aircraft fuel first on a much smaller plot of land using improved camelina in Nevada or Arizona with water from the Colorado River. That’s why the American military has tested its aircraft on fuel from camelina. Web Hub Telescope: We will have to see the energy balance on biofuels and whether they use more fossil fuels than they produce. They routinely need lots of fertilizer to achieve high yields. Well, sure, but that doesn’t make the problem wicked, merely multifactorial, like other crop breeding problems. The fertilizer problem is nearly solved, because the fuel doesn’t include much (or any) nitrogen, phosphorous, potassium etc, only H, C and O; the nutrient-rich residue from the refining is returned to the fields by the trucks and trains that carried the feedstock to the refinery, on their return trips to pick up more feedstock. It’s not that the idea is guaranteed of success, just that it isn’t “wicked”, and arguments that it can’t work are full of holes. The Fischer-Tropsch reaction, powered off a nuclear reactor, can produce hydrocarbon fuels and oils from biomass. Theoretically it would be possible to go directly from CO2 and H2O by using some form of ultrafiltration to remove excess O2. Until the fuel “crisis” gets really serious that won’t happen because of cost. The amount of methane, wet methane, and oil available in hard shale formations just in the US amounts to a 250+ year supply. Some of that is already being reformed into transportation fuels. Here in PA the cost of natural gas has dropped so low that shale drilling has dropped off dramatically. The only energy bottlenecks exist in the Federal government regulations and controls. Big Oil works out there in the environment. Their motivation to correctly understand Climate and Climate Change correctly is much higher than their motivation to distort anything. They understand data and they can see that Climate Data does not agree with Consensus Climate Theory and Models. I understand data and I can see that Climate Data does not agree with Consensus Climate Theory and Models. Big Oil has Climate Scientists who they pay who give them more valid forecasts and they don’t depend on the alarmists and media. I have no proof to back up my statement about Big Oil, but the Climate Data proof is in the Climate Data that you can find on NOAA’s website. Big Oil is not stupid, they have looked at the data. Temperature is not doing what the alarmists forecast and ocean level is not doing what the alarmists forecast. If you always forecast wrong, you are wrong. Why do we need these? And why are these the *only* things we need? Latimer Alder: Only a validated model can tell us how fast sea level is going to rise. Inundation of coastal areas will be the main cost of global warming. and the value of that land is one half of the cost-benefit analysis that will have to take place in determining the actions and timing needed to control the CO2 concentation in the atmosphere. Here are two facts to consider. The last time CO2 concentration was as high as it is now was 20 million years ago and sea level was 200 feet higher than today. Second: During the 350 foot rise of sea level that took place in the last 20,000 years, there were instances of sudden rapid rises that could put Florida under water in 100 years. So until we know how much the warming is going to cost we can’t know how much we can pay to fix it. Ross, those are interesting paleo anecdotes but we don’t actually know that there is any connection between CO2 levels and sea levels, so the model you are calling for is premature and may not exist. You are jumping ahead of the scientific debate. David Wojick: we don’t actually know that there is any connection between CO2 levels and sea levels, so the model you are calling for is premature and may not exist. I think it would be better to say that an accurate model may show that there is no relation between anthropogenic CO2 and sea level rise. The whole decision making problem that involves policies with worldwide and longterm goals is the mother of all messes and superwicked problems. Climate policies are part of that while climate change specifically and climate science more generally are just very difficult problems without the nature of a mess or wickedness. Lets take the USA. The first and last six months of life are the most expensive in terms of healthcare; but give quite different returns. If we were to take half the money spent on the Medically Insured at then twilight of their lives and instead spend (sorry invest) it on uninsured mothers and pre/post birth children the returns would be huge; infant mortality would drop, as would ill health amongst the poor. You want to tell people that they can’t spend their money on their own health, but force them spend it on someone else’s? This is the same thing as a global CO2 market, Westerners are being asked to transfer wealth to people they have no kinship to, for a better out come. I find it very hard to feel sympathy for the people in Bangladesh living in low lying areas, as i know population pressure is going to drive them under the sea anyway. Organ donation is simple. I will donate my organs when the doctors, hospitals, and pharmaceuticals for the transplant are also donated. I don’t see any positive result for donating organs so other folks can make large amounts of money off them. Applying a price to for a transplantable organ is a non-starter. Putting a price on it would automatically open up the Pandora’s box of buying and selling legal and not so legal organs from both willing and unwilling donors. There is some evidence that this is already happening in less civilized parts of the world. Simple, techno-optimism is more likely to solve superwickedness than Malthusian pessimism. They should take the McArthur ‘genius’ award away from a certain criminal hydrologist and give it to you. No messes with Kim, who can slaughter massed hoardes of superwicked problems with a single verbal lance. PS: that wasn’t sarc, but the kindly flattery of a fan. The IPCC separates out the problem quite well in its working groups. WG1: what will the climate do? WG2: what are the impacts? WG3: what are the solutions for the negative impacts? Unfortunately 2 and 3 are rather contingent on 1. Many people aren’t even sure about 1, so how can they even start to discuss 2 and 3? The scientists have a good enough idea about 1 to make some guesses about 2, and furthermore which of the 3’s will and will not work, given 1 and possible 2’s. CAGW has nothing whatsoever to do with supermessy wicked problems. All we have to do is collect the necessary observed data, and it will be clear that CO2 has no discernable effect on climate. It is that easy. But that’s not science Jim. Then all we will have is statistics that do not address the physical problem of climate mechanisms. Eventually, experimentation clean this mess up. Look how far Svensmark has pushed the aerosol envelope, Physicists left right and centre are hacking away at radiative transfer. Planetary harmonics and solar stats are flooding in and the climate itself demonstrates the woeful ability of GCM’s in predicting/projecting anything of usefulness in adaptation measures. Physics has the ability to sort the mess and will give up the road map eventually. Hanging around the crystal ball waiting for a vision to appear isn’t the way for the climate community to get themselves out of this wicked mess. This field of study has to open up to opposing theory and criticism. Sufficient data has already been gathered. Just Look At The Data. Temperature has been less than plus or minus two degrees for ten thousand years and sea level has been in a narrow range for seven thousand years. Seven because of the rise eight thousand years ago when a huge glacial lake finished dumping into the oceans. +1) Wicked problems do not have an enumerable (or an exhaustively describable) proof. +2) Wicked problems are so wicked that only wicked people would question them, stifling much needed debate. Apply all the questions to a more recent wicked problem: “How can we cleanly remove or destroy Iraq’s WMD capabilities when they are so well hidden”. You can chart all day long, but if you aren’t allowed to question the premise you’ll end up at war. I would propose (but have no proof) that most wicked problems are based on invalid premises. History is littered with wicked problems that existed mostly in our heads. A lot of the actual wickedness was a consequence of believing they were more real than they were. I would add that many messes and wicked problems are in the eye of the beholder, perhaps a slightly different thing than saying they are mostly in our heads, in stressing heterogeneous views. Presidents of the US is not too concerned with Iraq. The question was how can go in a direction so that America is not attack again in a similar way or worse way than 911. How you “cleanly remove or destroy Iraq’s WMD”, is with UN inspectors. UN inspector can only function if there is enough international support for the rule of law and the Iraq leadership is concerned about international views. Saddam interfering with UN inspectors was not a bright move- particularly when there was US president willing to take action. So the most immediate issue today is on same topic is in regard to Iran and UN inspectors. The world public needs to be kept informed of the status of the nuclear inspection program. Are Iranian making nuclear weapons? But another question which is asked is should Iranian be permitted to have nuclear weapons? Or a more stupid and dangerous question: should we insist that international law be complied with? Do we want this law as it stands? Because the international law is clear: Iran is not permitted to make or have nuclear weapons or the technology and means of making nuclear weapons. But also what not said as often is Iran should be enabled [assisted] in regards to having nuclear power. As member of NPT Iran has the right to be provided nuclear technology for power generation and other benefits of nuclear technology. Such a fine line is not easy [maybe silly]- particularly if nation is at war. Imagine the Soviets being part of NPT and not allowed to have nuclear weapons- how successful could the UN inspector function in the Soviet Union? I believe we solve such problems, by simply by changing the reality so nuclear weapons are less significant. Coupled with greater need of national cooperation. Change the game. Here’s a distinction. Iran is developing nuclear weapons, but claims they aren’t. Iraq wasn’t developing WMD, but claimed they were(which caused all the wickedness). There is more “wickedness” involved Saddam thought he needed others to think [or not be able to know] whether he had nuclear and/or chemical weapons. So basically Iraqis in higher positions were under the impression that Iraq had WMD. Saddam wanted to sow uncertainty, and in a thought controlled regime as Iraq was, he was successful. The only one who knew Iraq didn’t have WMD was Saddam- and Saddam may also been misled, because his guys were quite eager to spin good news. It was in Iraq national interest to ensure that the UN inspectors would be confident of their assessments- but Saddam didn’t think it was in his or his country’s interest. As far as difference between Iran and Iraq. Iraq lacked political support- he had violated Arab trust with his invasion of Kuwait. And his handling of the Kurds, forced the US to intervene. And Kurds were and become stronger supporters of overthrowing Saddam regime. And we wanted some political influence regarding their mad desire for Greater Kurdistan. And Saudi wanted Saddam gone. Other difference is Iran is bigger country [difficult militarily], and though they had their recent election robbed from them- at least it make some effort to make it vaguely look like real election- and generally it’s people are not not to such an extent psychologically oppress/brutalized. And though Iran leadership is indeed bat crazy and dangerous for it’s citizens and other people in the world; it does closely resemble a civilization rather than Saddam’s death camp. Granted Iran is partner in the NPTreaty and therefore allowed to have nuclear power. The solution is that they must use a form of nuclear power that cannot produce weapons- a thorium fueled reactor system. Getting commercial systems for a thorium reactor should be a top priority of the UN and any other rational nation. If you can produce power in a way that obviates the production of nuclear weapons everybody is safer. The remaining nuclear weapons can be gradually phased out since nobody has ever figured out a way to use a nuke in warfare. The end of WW-II was a special case that is very unlikely to ever happen again. That was one really wicked problem all around. Hopefully a dirty radioactive bomb won’t ever be exploded by a terrorist group, but fortunately the effects would be relatively small and localized. The Fukushima disaster is a good prototype. They’ve got a dirty, radioactive mess to deal with, but the number of people killed by radiation so far is on the order of 1-10. Not desirable or pleasant for but small enough to deal with. Having spent much of my career grappling with the poorly named ‘wicked problems’, the essence is in the definition. No problem exists until it is named and defined. The way it is named and defined shapes the pathways from there. I must confess that a lot of the stuff quoted in Judith’s head post is just arm waving in my view. I have seen dozens of consultants’ and academics’ models for problem solving along these lines over the years, and most of them are not very useful in the real world. Intractable problems are inherently political problems. They involve squabbling between powerful interest groups, and can only decisively be addressed by political action which cuts through the Babel of yelling and rests on fundamental principles. Needless to say, this rarely happens, because worthwhile solutions always involve powerful interests losing out. In my experience, timing is the critical factor in addressing intractable problems. There are brief moments in the political and policy cycle when it is possible to achieve something. Blink and you miss them. Like all humans, politicians blink a lot! Very true. I’m coming to think that the strength of democracy is it is very hard to do anything rash in the short term. ay to that. And as you allude to, those problems are usually boil down to a contention for resources, at least on the vocal ends. The bad news is that it is hard to do the right thing. The good news is that it is hard to do the wrong thing. This seems to happen anyway a lot of times. Robin, your number 2 applies in the case of Iraqi WMD, but in the reverse sense to that in which I understand you to be using it. The dearth of post-invasion evidence of WMD has been allowed to morph into evidence of their absence. The incompetence with which Bush’s men conducted the early Iraqi occupation has allowed the assertion that there were never any WMDs in Iraq in the first place to pass without challenge, but I’m not sure it stacks up. I read Richard Butler’s book about his ordeal as a UN weapons inspector. In it he describes in considerable detail being shown by the Iraqis disassembled and/or wrecked weapons, and lamenting, not their absence, ir that they were “so well hidden” but the fact that the Iraqis had so messed them up as to make COUNTING them impossible. His hosts weren’t trying to say they had NO WMD material, they were trying to persuade him that he had seen ALL the material there was to see, and he was afraid he was only seeing PART of it. That he was indeed looking at the remains, or rudiments, of a WMD development program he seemed in no doubt. A few months later, after the invasion, the WMDs had vanished, not only from Iraq, but from Richard Baker’s account of the matter. How do we reconcile these contradictions? Is it simply a question of a case of lecture-feeitis on Baker’s part? But if so, the fact remains – he found elements of WMDs. Can anyone shed any light? Yep, it was a bad time to be bluffing. And thanks for the remembrance of Canon Andrew White, an almost completely unsung, but very big hero of that struggle. “Wicked problem” is a phrase originally used in social planning to describe a problem that is difficult or impossible to solve . . . I strongly recommend never using this terminology because it directly dilutes the moral meaning of “wicked” to an amoral “difficult”. 1. Evil in principle or practice; deviating from the divine law; addicted to vice; sinful; immoral. This is a word of comprehensive signification, extending to every thing that is contrary to the moral law, and both to persons and actions. We say, a wicked man, a wicked deed, wicked ways, wicked lives, a wicked heart, wicked designs, wicked works. No man was ever wicked without secret discontent. 2. A word of slight blame; as the wicked urchin. 3. Cursed; baneful; pernicious; as wicked words, words pernicious in their efforts. The wicked, in Scripture, persons who live in sin; transgressors of the divine law; all who are unreconciled to God, unsanctified or impenitent. And thus likely to advocate immoral solutions. I can cope, albeit reluctantly, with the impermanence of American vocabulary, but I object to the rhetorical use of ‘wicked’. For people like Judith, passionately interested in understanding climate, climate may be a ‘wicked’ problem. For a very small number of policy makers whose field is affected to an unusual extent by climate, climate may be a ‘wicked’ problem. For the large parts of the 3rd world living in vulnerable circumstances, climate may be a ‘wicked’ problem, but it’s one with whose consequences they have been living, and dying, for generations, and there is no satisfactory evidence that it has been recently exacerbated by the activities of the 1st and 2nd worlds. For most of us in the Western world, it’s not a problem at all, wicked or otherwise. David, words change their meaning quite often. Nice, as in ‘nice girl’ underwent an inversion at about the time of Shakespeare. 700 years ago in middle English it meant foolish, stupid . It came to English via the French where it meant silly or simple and the French got it from Latin ‘nescius’; ignorant, incapable, The Romans used the compound of ne- negative prefix + sci- from scīre to know (as in science). As with glamorous, do we really think that the glamorous are capable of casting an enchantment spell over the observers? Wicked and Bad are both in the process of undergoing inversions, bad can mean bad or very good. Although, ‘nice’ is still used in a negative sense, e.g. “it’s a nice mess we’ve found ourselves in.” Perhaps that phrase could also describe an intractable problem, in modern academese. silly man trying to fight linguistic change. Language changes. Over the course of time some words even come to mean their opposite. ‘wicked’ derives perhaps from ‘wicca’ or wizard, but here too the notion that you can prevent language change is pure silliness. Actually, wicked in the original sense you mention, really does apply to many large complex problems. They are inherently political and many of the actors are pernicious, do have immoral ends in mind, and are addicted to power if nothing else. Even those with good intentions fall foul of the law of unintended consequences and their own moral shortsightedness. Since he’s a prominent figure, I can name former vice-president as one of those. What does Dan Quayle have to do with any of this? He left the impression of never contemplating anything more complex than which end of a soft boiled egg to open. *differences in risk between different types of traffic environment and speeding. … It is argued that if a problem is not perceived as a problem, is attributable to a misguided confidence in road user rationality, involves social dilemmas, or is closely related to the physics of impacts then it is likely to be difficult to solve. Amen to all that. Familiar, isn’t it. At the heart of all these messy, wicked and irritating problems are people — us. I’ve always wondered why we (at least in Canada) set insurance rates based on how much damage the person/vehicle is likely to sustain in an accident, rather than how much it is likely to cause. It incentivizes large vehicles good at ramming imo, making the roads more dangerous. Don, in many ways the CAGW obsession with CO2 is mirrored, in Australian road safety thinking, by a monomania wrt ‘speed’. In effect, since the introduction of static speed detection devices, the many good rules intended to make drivers behave more safely, such as those governing lane discipline and distance-keeping, have been all but abandoned, in favour of “speed” surveillance. I recently tried to obtain NSW stats on “speeding offences recorded” vs. “follow too close”, “unsignalled lane change” etc. They have all the stats on speeding, and seem very proud to display them. However they keep NO STATS for the many other hazardous (but less lucrative to the state) driving offences! i.e. it has never occurred to them to analyse them, or they have analysed them and would rather we didn’t see them. My guess is you could count on the fingers of one hand the number of such offences recorded, where no a accident has occurred. The fact is that it’s not speed that kills, but the rapid deceleration consequent upon collision. Like the presumption of human turpitude underlying CAGW alarmism, the intuitive wickedness of “speeding” is used to divert attention from the absence of any genuine attempt to enforce road safety law. One of the consequences of this has been to make certain sections of road, known by drivers to be unsurveilled, actually MORE dangerous than they were before speed cameras. Try Anzac Bridge in Sydney. Actually Tom, I find it remarkable that millions of journeys in hairy traffic or on dangerous roads are made every day with minimal carnage – especially given that almost everyone in Western countries drives a vehicle. If you trade off the benefits (eg being able to get to a doctor or hospital easily if necessary, being able to earn enough to look after your overall well-being etc) against road accident statistics on a cost-benefit basis, the results are overwhelmingly positive. This seems to me to be an example of something which is characterised as a ‘wicked problem’ because it is close to our everyday experience when there is a bad outcome. Statistically and objectively, however, it is a very small price we must pay for a very large benefit. JC comment: I find this pretty interesting. Climate change to me seems to be the mother of all messy super wicked problems. I like the mess mapping approach, with scenarios, etc. You are just the super wicked hot scientist to make sense out of it for the rest of us. 0. Disagreement about whether there is in fact a problem, or a problem which is speculated to arise some time in the future. N+1 : assumption that the problem has a solution. That presumes it is a problem. What if it was actually the solution to increasing agricultural output to feed our growing population? CAGW is a “home made problem”. The key appears to be to live in the present and not fret about hypothetical future hobgoblins that are fraught with extreme uncertainty. Social and political problems seem more likely to qualify as “super wicked or messy”. Certainly, I agree the solution for AGW is a “mess”. But the reaiilty of the problem can easily be resolved over time by science. It that case, the existence of problem is definitely tractable using the time-honored scientific method and proper statistical analysis. If only climate scientists would talk more to physicists and statisticians. This means establishing whether or not there is empirical scientific evidence (from real-time physical observations or reproducible experimentation) to support the hypothesis of CAGW. So far, this is not the case, ergo there is no problem according to the time-honored scientific method. PS Judith, climate science needs a “momma” right now – to let the world know that CAGW is a “home-made problem”, conjured up by folks that have too much imagination (in the form of multi-million dollar computer models) and too much time on their hands. Will you end up (reluctantly) filling that role? Happens at Climate Etc. every now and then. Aren’t “wicked messes” what economic market theory is best at? Isn’t it better that 1 million individuals each try their own solution and society reward those that work rather than a few bureaucracies attempt a few solutions created by consensus within that society? A progressive friend at work pointed me to the value of dissensus as a progressive idea. This appeared to me to be market theory packaged in a manner that is palatable to the left. Perhaps it is one area we could all agree about eventually. Doug, this is what I referred to earlier, when I mentioned self-organization and spontaneous order. But the first and second welfare theorems of economics are full of important assumptions that are not generally true in practice. Yet as Faustino (one of our occasional denizens) points out nicely, government failure is as likely as market failure. Decentralized action is capable of producing a remarkable amount of coordination of behavior, and aggregates and disseminates vast amounts of useful information. On the other hand, individuals don’t seem to handle durable goods (like houses and financial assets) very well, and this ramifies through decentralized orders in ways we don’t really understand very well, but we know are consequential (that’s a nice way of saying it leads to occasional catastrophies). The other big joker in the deck is externalities (both beneficial and harmful ones) when transaction costs are very high. It’s a joker in the deck because externalities are in the eye of the beholder, literally now, with all the mind-body connections we know about. I don’t even know anymore where to draw Mill’s line based on the principle of harm. If these comments piss someone off, thus raising their blood pressure, and so shorten their life, is that an externality, and has my speech violated the principle of harm? I don’t know plus I doubt it, but externalities are definitely the joker in the deck. P.E. You slacker, I did the Bonneville Power analysis that you dared me to do. My progressive friend and I have occasionally discussed various externalities. I would argue that it is these externalities that cause most disagreements where those disagreements are legitimate and based in fact. Doug, a crowd can guess the weight of an ox. However, if you restrict the type of crowd or throw away all the low or high estimates, they guess the wrong weight. If the true cause is known, it isn’t a problem that needs to be solved its a decision that needs to be made. Arriving at the right decision requires individuals who are suited to the task of developing definitive solutions which address the end users needs in an insightful way. The key terms are end user and insightful. Beyond the inability to properly define the extent of natural cycles, the cause of GHGs is known — byproducts of processes. There isn’t any mess, the cause is known to be pollution from poorly designed artifacts. The only fix to the UN IPCC Climate Science mess is to discard the IPCC and focus the entire funding on developing definitive solutions. Everyone has had enough of the Climate Science Psychobabble and wants to see definitive solutions that reduce the tax burden, save money, improve the environment and thus the human condition, and have a return on investment. Thus far, there aren’t any definitive solutions. But we do not agree that the true cause is known, so your initial premise is false. For that matter, the true cause of what? Non-problems do not have solutions. My initial observation is based on fact. We do know what GHGs are and know where they come from. That’s all we need to know to move on to decisions that make sense. Solutions that make sense do not include Carbon Taxation, Cap and Trade, or Government subsidized green junk that doesn’t have a return on investment. If the solutions were properly developed, they won’t need government involvement. Industry would be buying it up by the ton. Climate funding is better spent on product development and new definitive solutions to real world problems and not on the IPCC and related climate programs. Well, climate science is certainly in a mess! I hate to suggest a simple explanation for such an exotic topic, but consider the issue tree (which I discovered in 1973). A complex issue begins with a basic claim or proposal. (In the case of CAGW, it is that humans are causing dangerous warming.) There can be several challenges of, or questions addressed to, this claim or proposal. Let’s say there are just three. There can be several responses to each of these three challenges, again assume just three, a typical number. These responses are in turn responded to, and so it goes, layer on layer of increasingly detailed argument and reasoning. A simple tree structure, but wicked indeed. Here is the problem. If the branching rate is constantly 3 then by the time we get just to the tenth layer there are almost 60,000 points at issue. The tree as a whole has about 100,000 nodes. To get to the 36th layer requires 15 million billion considerations, which is of course impossible. The point is that complex issues grow exponential in detail, quickly outstripping human comprehension. This complexity is very simple. David, it happens that some of my experimental research involves social learning across generations of subjects (if you like, cultural evolution) about dynamic decision problems that have this kind of structure, and in which there is no analytical solution for a decision function that says what to do at every decision node. It’s fun! Subjects say the darndest things… and some of them turn out to be quite clever. What’s really interesting is figuring out how future generations separate the wheat from the chaff. Mind you, the system under discussion must be rich enough to sustain this much discussion, but many are, including climate. For example, we are nearing 200,000 comments here, probably over a million sentences. That is a large issue tree in itself, not to mention the many millions of sentences written elsewhere on the topic, perhaps several billion. The point is that in such cases there is no such thing as a thorough discussion, so rationality is always bounded by highly complex uncertainty, which is different for each person. Yet we move forward. How we manage to do this is the big question. I will take wind, for a dollar. It seems that most peoble have the same view as i have, that the mess is our own, and mostly invented. It is a tendency in the time that peoble react more on invented possible problems in the future, than on what is going on right now. Many scientific papers say that the investigated case may be a problem maybe if and so on, if nothing is done to adress it immidiately. It has become so normal, that hardly anyone takes care of our present problems. All have their focus on the possible sinester future, while peoble suffer around them. But of cause, it is much easier to solve the self invented problems than to cope with the daily tedious down to earth life. I hope you got the message with my danish-english. I am fed up with reports of coming disasters if we dont do that or that. The message is clear and I agree 100%. It’s a post-modern (PoMo) thing. Pretending to care about remote and abstract “problems” instead of really caring about real people nearby and really doing something to help your own real neighbors. We have an English expression: “Charity begins at home.” I assume there is a Danish equivalent. Nice to see that you all think continuously increasing gas prices due to increasing scarcity of cheap crude oil is not an issue that you and your neighbors are concerned about. Oh, is that a problem of the future? Never mind. Instead of future disasters, see the major “mess (disaster) we are now experiencing. Has the Global Economy Become Less Vulnerable to Oil Price Shocks? Dr. Mingqi Li, an associate professor of economics at the University of Utah. From January 1994 to May 2004, on average, it took only an increase in oil price by 0.97 dollar to bring about one million barrels of additional daily oil supply. From June 2004 to November 2011, in average, it took an increase in oil price by 11.8 dollars to bring about an increase in daily oil supply by one million barrels. 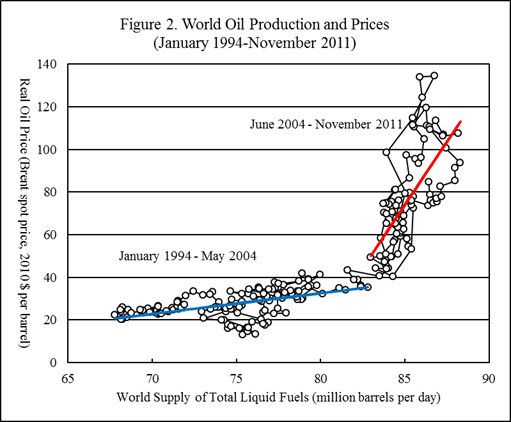 Thus, the observed “world oil supply curve” had become dramatically steepened by almost 12 times. . . .
See the graph of the major change. an increase in real oil price by 10 dollars would be associated with a reduction of world economic growth rate by between 0.4 and 1% in the following year. For a global economy that in average grows at about 3.5% a year, a reduction of this size is very significant. . . .if the world oil production does peak and start to decline in the near future, it may impose a serious and possibly an insurmountable speed limit on the pace of global economic expansion. The International Energy Agency now projects no increase in global crude oil production for the forseeable future. It suggests crude oil production may have peaked in 2006. Now that is a very big mess! I consider that resolving the AGW issue does not really require that agreement is reached on defining the problem, when there may not have been a problem in the first place. Others have already said that the main problem is humankind and IMO we all have considerable baggage to dispose of before enlightenment is possible, given that enlightenment is what the most of us are seeking. . . Mark Vachon, head of the “ecomagination” sustainable business initiative GE launched in that year. He said revenues generated by operations in his portfolio now totalled $100bn and were growing at more than twice the rate of those in the rest of the company. Our problem is that we are financing his solution. Traditionally in a free market economy, it is the other way around. GE is one of the biggest green, rent seeking, crony capitalist corporations in the US. Asking GE about climate policy is like asking Michael Mann. And for the same reason. Once you hitch your wagon to the government, you better toe the (Democrat) party line. That’s your source of funding, not the free market. From the bailout of GE Capital, to the 25 billion GE got out of the first stimulus, to that 4 billion in “tax refunds” GE received from 2005 to 2010, to the federal mandate to purchase the stupid new light bulbs GE makes, to the huge subsidies for GE’s other “green” development programs, GE looks to obtaining money from the government first, and from the sale of products a distant second. Yes, this is the Bureau of Wicked Problems, how may I help you? No, sorry, we don’t accept problems from the public. Why? Because formulating and processing wicked problems can only be done within the organised confines of a highly sophisticated government department like ours. You need to understand that only the WP Bureau has the necessary co-ordinating departments to be effective. Look, let me explain: we have a ‘Framing and Enhancement Department, (FED) on the second floor, there’s ‘ Implications, Assessments and Outcomes,’ ( IAOD ) on the third floor and ‘Public Awareness and Hype Department’ (PAHD) on the top floor. And good day to you too. By golly, we’re a proud service of the Lost Electricity Reclamation Agency! Unfortunately, it would be a phone call to the Bureau of Homeland Security and the opening line would seek to identify the caller. These all sound the same to me. But the problem of multiple objectives (say a vector of goods X = (X1, X2, X3…,XN)) isn’t a particularly compelling issue if a decision maker has weakly ordered preferences over the vector. If there are weakly ordered preferences then there exists a value function V(X) to serve as an objective function. So what is the real problem here? The three statements above don’t really define the problem very well. If the point is that no ordinal procedure amongst a group of stakeholders (ouch I hate that word) can weakly order X in a sensible way, then this is well-known from theoretical discussions many years earlier (Black 1948, Arrow 1950 and even earlier Condorcet 1785). So what’s so special about that, and why should these OR guys get special credit for noting it?…If side payments are allowed, and the different interested parties can register relative preferences in a cardinal (as opposed to strictly ordinal) way, the whole problem can go away. Unless the cooperative game has an empty core, and there’s nothing about this in the list. Empty cores are a real mess. Again, I see nothing special about this. Is the supposed problem that the objective function V(X) isn’t separable across the elements of X? Or that the constraint vector g(X) >= 0 isn’t a set of constraints that are separable across the elements of X? Neither issue is necessarily compelling from the viewpoint of general nonlinear programming. They may make the problem more computationally difficult, but that doesn’t imply intractability. A difference of degree, not kind. I see no reason why these cannot be added to the definition of either the constraint vector g(X) >=0 or the object function V(X). In the case of utilitarian issues, dump ‘em into V(X). In the case of deontic issues, dump ‘em into the constraint vector g(X) >= 0. So what is the point? So use expected and conditional expected values in the constraint set along with appropriate feasibility constraints in the constraint vector g(X) >= 0. So use any number of objective functions meant to deal with this, e.g. expected utility, rank-dependent utility, recursive utility, Choquet expected utility and so on. No shortage of proposed objective functions for choice under uncertainty, including cases where subjective probabilities aren’t well-defined. Are these characteristics of the problem, or of the people trying to solve it? At any rate, the difficulty of imagining consequences isn’t very special…Dan Kahneman has been arguing for the last decade (I think not very convincingly, but I digress) that no one does this well, even in the case of cheeseburgers consumed tomorrow. Really, this is just complaining that the control vector is large. That makes problems more computationally challenging, but not necessarily insoluble or intractable. In other words this is a difference of degree, not kind. Side payments can obviate this. By side payments, I don’t necessarily mean money. I mean concessions, in a very general sense. If calling them “civil unions” instead of “marriages” makes a huge difference to fundamentalists, but not to members of the LGBT community, then we have the basis for a very beneficial linguistic side payment. 14.Problem solver(s) out of contact with the problems and potential solutions. Frankly, the former might be an advantage, given that automatic affective reactions to decision problems can conflict with reasoned, conscious and constructive rational analysis of decision problems. As far as the latter goes, knowing the constraint set is a real problem, but again this is true of simple individual choice problems where none of the other factors are involved. If you don’t properly understand the constraint set (feasible vectors X), then you can’t properly solve the problem. But that is true of every optimization problem. So again: What is the point? NW, I like this post, but it’s awfully abstract. If the topic of “wicked” etc problems ever comes up again, add examples along the way to show that problems with these characteristics have been solved before. I think that all these problems characterized the building of the Eisenhower Interstate Highway System, a work still in progress but highly satisfactory to almost all long-distance travelers in the U.S.. Or the international airline transportation system: hardly perfect as everyone knows, yet people use it more and more every year. Adam Smith used the example of a factory making pins, and Milton Friedman used the example of the Ticonderoga number two pencil. These intellectual deep thinkers couldn’t make either. I don’t see messes or wicked problems as imparting the true flavor of the issue. The Marines have an intuitively understood expression that imparts the nature of the unsolvable problem that only gets worse with every attempt to solve it: a cluster-####. Your right, it is a super wicked problem. Egos, bias, prestige, grant system, IPCC, government change, political lobbying, education, etc.,etc.,etc. have helped to keep science confined to man-made constraints. It is a super huge area that would be extremely difficult for a single person to grasp the many, many areas of study it would take and years to even put a dent in the complexity. BUT, our scientists have tried to cheat by being statisticians seeking patterns that do not actually exist in a confined parameter of time. Rather than study the planet, they have been studying data that is not accurate and cover every avenue of our planet. I know that our measuring of atmospheric pressure is incorrect as like the ocean, it is layered. Many others areas have not been considered at all due to the focus exclusively to data that really does not mean much. “The battle to feed all of humanity is over. In the 1970s the world will undergo famines–hundreds of millions of people are going to starve to death in spite of any crash programs embarked upon now.” -Paul Ehrlich, The Population Bomb, (New York: Ballentine Books, 1968), p. 13. “We can be reasonably sure . . . that within the next quarter of a century [by 2000] mankind will be looking elsewhere than in oil wells for its main source of energy.” -Paul Ehrlich and Anne Ehrlich, The End of Affluence (Rivercity, Mass. : Rivercity Press, 1974, 1975), p. 49. Wicked problems tend to generate absurd solutions, that is “solutions” which are absurdly disconnected from whatever “the problem” is, where anyone later has to ask “what were they thinking?”, what reality-distortion-field or mass hypnosis was in effect? Couldn’t they see the solution wasn’t any good? examples: The Final Solution. Prohibition. Mutual Assured Destruction. almost any war: WW I (mass suicide), the Civil War (the ultimate messy divorce), the Vietnam War (what was the point again?). The War on Drugs (prohibition the sequel). The Iron Curtain, The Wall. not to mention: let’s drive the economy back to the stone age to save the planet. If a problem is intractable, dump it and do something to help solve the problems which aren’t. Plenty of real problems out there – clean water for all would be my top one. Very good point. Interestingly, quite often, solving one generally agreed real problem (eg clean water) often at least contributes to solving a whole bunch of others which are being separately addressed, or not (eg water borne diseases). The Law of Unintended Consequences cuts both ways. Clean water can fix problems we don’t even know about, or conceptualise as separate problems. If you only look at Climate Data, the most recent ten thousand years has been the best that Climate Has Ever Been with respect to Climate Change. Nothing Wicked Here. We don’t have anything in actual data that points to a Climate Change Problem. Temperature is well inside a bounded cycle around the average of the last ten thousand years. The Super Wicked Problem is the Lack Of Understanding of this well bounded cycle which is less than plus or minus one degree most of the time and less than plus or minus two degrees all the time. It is only when you look at the Flawed Theory and Models and Alarmist Forecasts and the Wicked Proposed Solutions that you find the super wicked problems. This whole discussion seems to me like a distraction from the partial, approximate, entrepreneurial ways that difficult problems have always been solved. Winning the Revolutionary War against Great Britain and then writing the Articles of Confederation and Constitution were “wicked” and “messy” problems; they were not solved all at once, nor perfectly, and some attempts at the Constitution were later reversed, giving us, among others, the 13th and 14th amendments, and the repeal of Prohibition. Building Mode-Ts, building roads and installing a nationwide system of fueling stations could never have been accomplished by this sort of thinking. Nor could this kind of thinking have won either the Battle of Britain or the Battle of the North Atlantic. The next problem that has to be solved to a sufficient degree of approximation, and toward solving of which there is an effort, is to figure out what doubling the CO2 concentration over 70 years will in fact do to the climate. That isn’t a “wicked” problem, it’s just hard and multifactorial. Trying to solve all the social problems before that has been achieved is also not a “wicked” problem, it’s merely guesswork. This plot on Pielke Sr.’s website has me thinking. The Red and Blue lines are temperature series, without and with volcanic ‘forcings’, based lines through the same period. 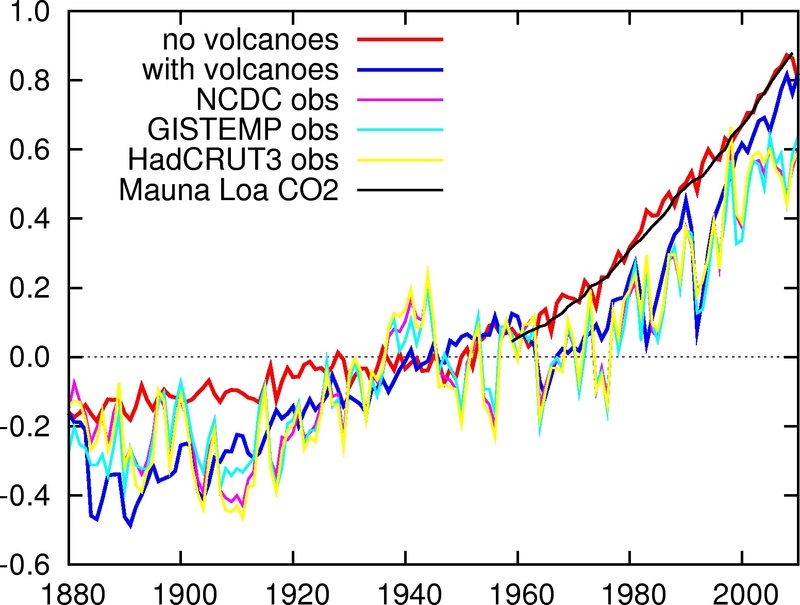 Now if we were to sum the plots, the one with volcanoes would have far less total temperature; does the Earth with volcanoes have less ‘heat’ in the system? The only reason I ask is that the difference in the two plots at any point is less that the difference in temperature of a winters night and a summers day. If the little ice age was caused by volcanoes, it would seem to me that that first figure might be a touch misleading. Then there is the “ill-posed” problem. Trying to define a global average earth surface temperature value from the currently available temperature measurements of land and sea temperatures is an “ill-posed” problem. The chance of getting a useful numerical value from objective mathematical manipulation of the earth’s surface current temperature measurements that could correlate well with global average temperatures that climate models predict, or other proxies for the long-term temperature trends of the earth, such as satellite measurements of atmospheric temperatures, ice core data, sea bed data, etc. is doubtful. Yet so much in the climate debate focuses on these surface temperature measurements. A much more well-posed problem is defining the daily average surface temperature of a specific location on earth (or region of the earth’s surface covered by an appropriate grid of temperature measurements). When GCM climate models are ready to answer this well-posed problem, I’ll take them more seriously. Or, if these “wicked” GCM models can explain why the earth has warmed or cooled by 1 or 2 deg C for the last 10,000 years of stable climate behavior as recorded in ice core data, I might also get more interested in their predictive ability 50 to 100 years into the future. and one assumes that at temperature equilibrium, the Energy radiated into space by the Upper Atmosphere to balance the net Energy absorbed by the earth’s surface is only 1/2 of the energy radiated by the earth’s surface, because the same energy radiated to space by the upper atmosphere is also radiated back towards the earth by greenhouse gasses in the atmosphere, then one can calculate energy radiated by the earth’s surface temperature = 2xEnergy In = 2×238 = 476 W/m^2 Using this surface radiation flux, one computes the earth’s surface temp to be 303 deg Kelvin. (Note that I borrowed this simple model and calculations on how greenhouse gasses warm the earth from Dr. Andrew Dessler of Texas A&M University who is a CAGW alarmist. Without greenhouse gasses in our atmoshere, the earth’s surface would only radiate back into space the incoming energy of 238 W/m^2 absorbed by the earth that would make the earth’s temperature 255 deg Kelvin, or 48 deg K colder than currently….thank goodness for greenhouse gasses). However using Dr. Dessler’s own very simple and hard to refute model, I reach an entirely different conclusion about relative importance of human activities and naturally occuring phenomena regarding climate change. The above equations can also be used to calculate changes in So or albedo that would produce a drop in the earth’s surface temperature by 1 deg C to 302 deg. Kelvin. If currently So = 1360 W/m^2 and albedo = 0.300 in this warm period with 303 deg K surface global average temp, only a 1.3% change in So, or a 3% change in the earth’s average albedo can change the earth’s surface temp by 1 deg C. This compares to a doubling of CO2 concentration in the atmosphere to also get a direct surface temp change of about 1 deg C (without all the controversial positive and negative feedback mechanisms and values to amplify the CO2 effects). Setting this climate change model feedback amplifier controversy aside for a moment, because any warming or cooling from So or albedo changes also gets magnified by these same controversial feedbacks (except cloud feedback which I have handled directly and included along with snow cover and vegetation cover changes as an albedo change). Therefore, from this very simple energy balance model and radiation equilibrium considerations, a 1.3% change in So (changes are known to occur from variability of the Sun’s output and orbital mechanics of the solar system) or a 3% change in the earth’s average albedo (affected by cloud cover, snow cover and vegetation extent which are variable) have the same effect as a doubling of CO2 concentrations. Why are climate scientists so focused on CO2? It isn’t a “biggee” compared to solar radiation and the earth’s albedo!! An engineer would never try to control the climate system with such a weak feedback mechanism as human releases of CO2. From the very simple energy balance model, it seems like we could control climate more simply by working out an engineering solution to controlling the earth’s albedo (I don’t think we have much of a chance of controlling the Sun’s output or changes in orbital mechanics of the solar system). I think there are other helpful engineering solutions such as engaging the earth’s enormous heat sink of the deep cold ocean water to help slow down the ocean surface temp rise, should this become a problem. Reflecitve albedo with a sunshade is how we aerospace engineers solved the Skylab thermal control problem after its solar arrays were damaged during launch…..and we only had a few weeks to arrive at a solution, get it engineered, and launched to save the SkyLab missions. It wasn’t pretty; but it worked! Let’s get some more engineers thinking about the climate change issue!! I agree with Dr. Curry in her Demon Coal blog today….let’s broaden our thinking about the climate “problem” and potential solutions. What is “The Problem”, really, that we want to solve? Given the small effect CO2 can have on climate relative to naturally occuring changes, and the big effect a little warming and more CO2 can have on global food production, have we stated “The Problem” correctly that we want to solve with costly action and potential harmful consequences? I forgot to give a reference to Dr. Andrew Dessler’s model I used in the above discussion. So, when addressing any problem, it is best to “Do the Dumb Things First.” Validate whether the problem can be better stated in the first place. It is a lot cheaper to make an ILL-Posed Problem go away than to solve a Super-Wicked one. Why are climate scientists so focused on CO2? As a question about history the answer is totally clear, and I don’t understand, why the question continues to be presented. The scientists have been focused on CO2, because the whole discussion of global warming started from the observation of continuous rise in the CO2 concentration by Keeling, not from an observation of warming. At the time the recent warming hadn’t even started. Without any observed warming the scientists made estimates of likely future warming and that was enough to initiate the interest in studying, how strong the influence of CO2 will be. The initial question was not the general question of explaining observations about changing climate it was about the warming influence of CO2 – and it still largely is. Later observations have, indeed, shown that the early estimates on the strength of warming are roughly equal to the warming that has occurred since. I don’t make any statements on quantitative accuracy, but there’s no doubt that the observed warming is consistent with the ideas presented in 1970’s. Such a success in predicting something that had not yet been observed at all is usually considered a strong confirmation of those ideas. Some people think so also in this case, but as we know very well, not all. I disagree. The real focus started much later, I would say after the Hansen’s testimony in 1988. By the late 1990s it became all the rage. Does CO2 create a threat that requires policy acts? (And unfortunately to a lesser extent the nature of best policies, if any are justified). Worries about natural variability have never been a similarly valued issue. When the only real issue of importance is the role of CO2, it’s pretty obvious, why it is the focus of attention. I should add that the proper reaction to the importance of the CO2 issue may well be a wide research directed to understanding climate in general. Science suffers from a too narrow focus even when we want to learn the answer to a more limited question. I would agree with the “understanding climate in general” sentiment. Unfortunately there are only a few of us on this commenting forum who actually hold that interest. The majority of the fake skeptics are what I call “trendologists”. Edim, Hansen’s testimony was just part of the globally orchestrated focus. The UN IPCC was founded that year, which takes several years. The USGCRP law, which focused a billion dollars a year on CAGW was enacted in 1990. The UNFCCC was in 1992. So the movement hit its stride in the mid 1980’s and hit pay dirt in 1990-92. I suspect the mid-80s CRU Jones-Wigley temperature model results were the necessary trigger, by showing warming. Post Hoc, Ergo Propter Hoc. True if CO2 caused the temp. rise. False if CO2 did not cause the temp rise. Had we not anticipated, we might not have fallen into error, fallacy and extensive wickedness. It’s always possible that a phenomenon described by a few numbers agrees with a theoretical explanation by accident. Still it is true that the prediction was a genuine prediction. To me this is so clear, because I learned about the predictions in 1980 without any prior knowledge that climate could somehow become a limiting factor for energy use. For the sake of record. I learned about the issue from the IIASA energy systems analysis project whose results were published in book Energy in a Finite World. The estimate of warming was taken from a 1977 paper by Augustsson and Ramanathan. The estimated the climate sensitivity as 1.9 C.
Once again, Pekka, it depends on which so-called observed warming we take as accurate. UAH shows no warming since 1978 except in conjunction with the 1998-2000 ENSO cycle. Nothing to support prior AGW predictions, nothing whatever. The surface statistical model results are absolutely not observations. They are model results, from complex and questionable models. Calling these modeling results observations is one of the deepest fallacies in the debate. yes, if you leave out the warming there is no warming. For 1 deg K less surface temperature, or Ts = 287 deg K, the earth’s surface must radiate only 383 W/m^2 upwards towards the atmosphere, which could be achieved with a 1.76% reduction in the Solar Constant, So, from 1368 to 1344 W/m^2. For a one degree drop in Ts, albedo would have to increase by 6.5% to 0.333 so that only 161 W/m^2 instead of 168 are absorbed by the earth, assuming convection (24), evaporation (78) and atmospheric re-radiation to the surface (324) values stay the same. These percentage changes obtained from a more accurate radiation balance model, still show the big drivers of the earth’s surface temperature to be the incident radiation received from the Sun and albedo. Very small changes in these key variables compared to a doubling of CO2 concentration in the atmosphere are required to change the earth’s surface temperature by 1 deg C.
Wrong. Here is a simple example. Prior to the collection of data from the Berkeley Earth project there were places on the globe that were unreported. There was data, people just werent using it. Yet, a calculation of the “average” of the measured places provided an estimate for the unreported places. So what do you suppose? We have an average using 7000 stations. The entire globe isnt covered. Then we add 29,000 stations. How well did the average of 7000 predict the average of 36K? pretty darn good. Why? because the average of 7000 is an estimate, a good estimate, of the value of any unmeasured place. Now retroactively place another 100,000 thermometers, in places where they are lacking cause their ain’t people there, and see what you get. That is interesting, so I assume you could randomly take 80% of the existing 36k stations a large number of times and figure out a rough error bar for the 29k pure data points (or something similar). I would imagine doing a similar thing using geographic weighting would produce larger error bars. That might help getting a scope on how geographic distribution of data points affects the data. Probably all of this has been done, sorry, I’m not familiar enough with the history of the papers to know where to look. I guess I should just try it : ). I’d also be interested in generating mock super precise data of oceans that fit what we know about how regularly temperatures can change over distance and depth. That algorithm could be seeded with Argo data for different periods, then run that through the existing code to find the range of errors. I know there are methodologies for determining error in science, but this could be a shorthand test to see how well they’ve been applied. It is very hard to gauge the error size in these things, and if the error is absolute and fairly constant in scale and direction, or it drifts over time. I was really commenting on the signal to noise problem of trying to detect less than a degree C/century change in the true global average temperature (that climate models predict and try to correlate with) from large daily and seasonal oscillations in surface thermometer readings that are not evenly spatially dispersed over the earth. My home’s outside thermometer can change 1 deg C in a couple of minutes (probably a cloud passing by). One deg C per century is a fairly small signal in the averages of all the wiggles in all the measurements that occur in one century in the presence all of the other longer term biases that can creep into specific measurements due to siting issues. Given that much of the globe is not covered with measurements, so assumptions are made about what the temperatures in the unmeasured regions actually were that adds to the unmeasured noise in the system. Cloud formation also has some spatial biases (eg. land/sea interfaces where cloud formation locations reverse from daylight to dark) that would affect actual temperature of unmeasured regions relative to measurement stations. Small signal and lots of noise. I think it would be a better posed problem to have the climate model predictions compare to actual temperature measurements in a region of well-gridded and sited temperature measurements. The noise is not a problem at all. The number of measurements that contribute to the calculated annual average is well beyond one million. Thus all noise that influences independently each measurement will have a combined effect of roughly 0.001 C on the result, perhaps a bit more, because some measuring stations have a significantly larger weight than the average. All significant uncertainties are due to other factors than noise, i.e. to various systematic errors that are involved. The systematic errors are certainly much larger in the determination of absolute temperature levels than they are in the determination of the change in temperature at least for a few latest decades, because many of the largest uncertainties are rather constant in time. I believe “Mess” and “Wicked Problem” are really the same thing; interchangable, really. I was about to say that as “Black Swans” and “Dragon Kings” are really not different, just degrees of the same mistake, the “Wicked” and “Super Wicked” are really a question of degree. (grin). Yep! That’s a distinction worth keeping. TRUE. There are differences of opinion as to whether there is a problem and how big it is. The need for a solution is being promoted way ahead of any solution that is proven to work. FALSE. Obama came up with and the world accepted a stopping rule of 2degK warming. Does this make the problem less of a wicked one. It sure does to me. Science can demonstrate if it is ever possible for more than 2degK warming to result from a complex system with multiple positive and negative feedbacks, by properly analysing all the feedback mechanisms. TRUE. There is no test whether a potential solution can solve the problem, because of 1. This part of the definition is partly redundant. BUT science is able to test the feasibility of proposed solutions in the laboratory. Nobody seems to want to do this. TRUE. There is only one earth. BUT science can quite happily explore phenomena in the laboratory which enable us to understand phenomena in the universe, even though there is only one universe. BUT fables are there to remind us of our own stupidity when we can’t see it in our own stubborn ignorance. TRUE. CAGW theory supporters propose there is only one possible solution – ie reducing carbon dioxide emissions. BUT science can help explore, test, and verify multiple possible alternative solutions. Sorry, but I still don’t see a wicked problem, unless I put the rose-colored, diamond-studded CAGW crystal glasses on. Civilizations go over the cliff not only because some new condition arises but because of a second factor: the leadership is locked into institutional solutions beyond which they cannot intellectually venture. They are hogtied by The Base into adopting acceptable solutions. It is the combination of a novel challenge and fixity of response that proves so deadly. Don Surber notes that President Obama’s supporters hate one chart above all — the one of their own making — because they cannot find a way to simultaneously claim that it is both a guide to the future and a map of their failed recent past. It’s the chart that makes liberals cry. They say it is unfair. They say it proves nothing. They say it is racist, sexist and taken out of context. But mostly, they cry because they made the chart up and the chart is being used against them. Conservatives are making them eat the chart of “Unemployment Rate With and Without the Recovery Plan,” which Barack Obama used to sell the $787 billion stimulus — the largest gamble ever made in the history of the world. The worst thing about the chart is that it represents their plan for the future. The map of failure is simultaneously their hope. More tax and spend. More deficit spending. That is the range of composition they can play, and even if it is dissonant that is all the sheet music they have. While some have described the willful repetition of failure as insanity, the administration’s supporters will claim that the only defect with the past stimulus was that it wasn’t big enough. Joe Wiesenthal argues that the President will be right in the end if he pours enough money into the same rathole. So: Have The White House’s Keynesian stimulus ideas been debunked? Here’s what you need to realize. The original chart above comes from a document (.pdf) that was put out by White House economic advisors Christina Romer and Jared Bernstein on January 10, 2009. It’s important to recall that his was right in the throes of the recession. At the time, things were weakening much faster than anyone could possibly realize in real time. The EU is doing exactly the same thing. Each time a bailout fails, it comes back with a bigger one. At last report, they were rattling the tin cup as far away as China, India and Brazil. Their idea is presumably that when the bailout gets big enough then the doubters will be intimidated and leave the elites the masters of the field. So.. is the credo of Climate Etc. to be “Mess Is Our Product”? Would then “MIOPia” be the Uncertain point of view? There is another related usage of “mess” that is elaborated in a social research methods book by John Law (who’s often associated with sociology of science and actor-network-theory), which I gather is now required reading in many methods courses. I read it out of curiousity last year an quite enjoyed it – Law’s style has always been amongst the clearest in his field, even when he’s writing about messiness. What about some wicked solutions for humanities problems? No. You have to prove first that it is a problem. The only wicked thing is the mass hysteria that some people have whipped up. hmm… require super wicked solutions ? my first bias is religious. religion is part of our wiring, a box to be ticked, with whatever. religion boils down to 1 do good things 2 don’t do bad things. those 2 points are my motives. I have a problem solving ‘tool kit’. tool 1 ‘thinking outside the box’, with whiteboards, (harder to lose than the back of an envelope) tool 2 kiss method (keep it simple stupid !) tool 3 task analysis. tool 4 action plans. first tool, concept map of problem solving. using whiteboard, tease out problem. put up all observations, without evaluation. my whiteboard is 2.4 x 1.5 square metres. we are looking for quantity, not quality, of observations. we’ll evaluate them later. let’s consider time, the super bit of our problem. time is subjective, can go faster or slower. we ‘travel’ back in time when we study ice cores, quasars. our need is to manipulate the future. I think time is a minor part of my problem. “if no one has died then we can take our time to solve the problem” sadly, people are dying horrific and untimely deaths in the name of cagw. how to stop that ? let’s go to people. maslow defines people well enough. we become nasty when we compete for resources. let’s go to climate. climate and weather allow us to maintain and grow maslow’s hierarchy, or not, and usually somewhere in between. let’s go to change. change is happening exponentially faster, technologically, and from a societal viewpoint. here’s my view of biomass (the living stuff) adapting to change. maybe it starts with reproduction, a time constraint. evolution started with instinct, then to imprinting, ‘rigid society’ (rules), ‘adaptive society’ (less rules), ‘super adaptive society’ (very few rules). I think we can agree that change is happening faster. where to next ? let’s define the problem with a ‘spheres of influence’ model, like a target, circles around a point. the target is personal, you have the most influence here. we are concerned with eating sleeping etc. the next zone is familial, you have a great deal of influence in this zone. other zones, with less degrees of influence, include neighbours, local environment (where I don’t see much in the way of climate change, but lots of economically disasterous government policy implementations), local government bodies, state bodies, international relations. we can look forward to an evolution of policy making. it’s essential to consider the reading audience. I’m thinking there are messages here for all spheres of influence. 1 you have most influence on your own life. become healthy, keep learning, help others. if at all possible, swim ! these days I try to use the ‘4 agreements’, 1 speak well 2 don’t take things personally 3 don’t make assumptions 4 do your best. as a code for living, it doesn’t need the paradigmes of transactional analysis, archetypes, operant conditioning, or being possessed ! cognitive behaviour analysis/therapy is the status quo in my society, and works well if you are cognitively endowed. luckily the therapists are ! 2 your family is your connection to the past and future. the evolved family is ideas based. 3 friends and neighbours engage in cultural pursuits. 4 local governments provide effective services. 5 countries and international powers need to stop killing. intuitively we have an answer, and look for proof. here’s my opinion. 1 adopt a suitable ethos. specifically develop multi-faith organisations with express task of removing ‘hatespeech’ from dogma, and emphasising commonalities, as necessary. the ‘global glitches’ are centred around the islamic/judeo-christian interface. what is the cost of that catastrophic militarism ? 2 educate the rich 3 educate the poor 4 government provision of essential services. to my mind, there are several features of a cognizant brain to be developed. 1 language 2 intelligence 3 passion. language might be the one to work on. Wicked and mess ARE NOT generally accepted technical terms. I’ve never heard of the latter and the only place I heard the former is a couple stupid Adam Sandler movies.